Touch opens with a short prelude from the POV of Nathan, the deceased boyfriend of protagonist Emma who was not present in the first title, Silence. Nathan chronicles his thoughts and existence from the moment of his car crash to “present day,” roughly three or four months after his accident. We discover that he was given an order by the Queen of the Dead to go home and watch his family and friends. The book then begins its story shortly after the conclusion of the first title. Emma’s friends are trying to adjust to a routine after learning about her ability to see ghosts and the existence of Necromancers, humans like Emma who have the ability gain powers from using ghosts’ energy. Necromancers work for the Queen of the Dead, who wants to kill off Emma’s friends and family. Although I don’t normal read and enjoy YA literature, I was completely enamored with Silence, the first book in Ms. Sagara’s Queen of the Dead series. The story was engrossing and characters strong, keeping me glued to the pages, despite some confusion while reading the book. Unfortunately, the second story, Touch, did not hold my attention like the first book did. The small issues I had when reading Silence only grew and became problematic the second time around. The plot is slow moving and seemingly without a clear direction at times. There is entirely way too much introspection by these characters, and at times I just wanted to skip over the repetitive analysis of true friendship, love and death. Overall, Touch focuses on the emotional development of each character rather than be driven by the plot and action. If that is your cup of tea, you may enjoy the book. However, I wanted a cleaner/clearer storyline that moved from point A to point B. There are side stories which are critical for the further development of the characters, but did nothing for the overall plot of the book. Unfortunately, each of the characters fell flat for me. The strength I found in each before, seems to have fizzled under the weight of insecurity. Too often characters are harshly judging themselves or uncertain what course of action would be best. The only character who seemed to have her act together is Amy, the Cordelia-like (Buffy) friend of the gang who takes charge, even over the knowledgable elders. And don’t get me started on the parents who didn’t seem to care that their kids are leaving at all hours of the night and won’t share where they are going. These kids must live in a world where parents are gullible, and I found it annoying. I like that the author tried to include the parents, but I felt it was an inadequate effort. I appreciate that the book does not shy away from some thoughtful and meaningful issues and ideas, the primary being what it means to be a true friend. It also touches on the subjects of moving on and forgiveness. On the surface, I like the topics and how they are handled. However, after a while, the discussion carried on too long and the story became lost in introspection and repetition. For example, I appreciate the theme of friendship and what defines a true friend, but I was bogged down by the constant reminders that Emma and Ally are best friends no matter the dangers. They continually have to justify it to the Necromancer Hunters, Chase and Eric, and it got old. Once again the author makes the reader work to comprehend the fundamentals of her world. While I appreciate not being spoon fed every detail, it made for confusion, and after two books, I would have like a little more concrete idea of what is happening, rather than having to infer every detail. I’m still not entirely clear on who the Queen of the Dead is and why she wants Emma so badly, which bothers me. There were times that I re-read a section more than once, yet still felt like I was missing something and didn’t fully comprehend the significance of what was said or happened. While there are some exciting and tense moments, unfortunately they were too few and far between. One of the side stories involved a deceased child who was lost and wanted to go home. There is such great potential for action in the story line; however, it ended with a rather long commentary on forgiveness. In addition, at one point during the deadly climatic confrontation, two separate characters took a rather lengthy time to evaluate his/her life and place in the world that I felt they certainly should have been killed off during that time! 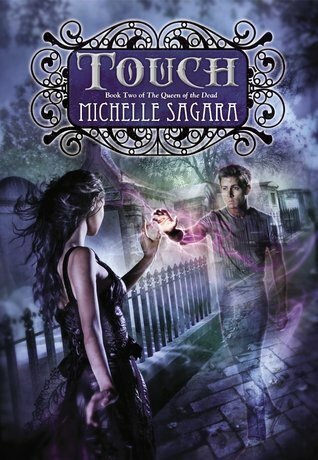 I had high expectations for Touch after reading the first title in Ms. Sagara’s Queen of the Dead series. Unfortunately, I was disappointed in the title. It has some good qualities, and the very ending was excellent and holds great potential for the next book. However, the good was overrun by too much introspection and discussion of heavy topics. While I appreciate the discussions, they all became repetitive and some were ill-timed, which detracted from the book and plot. If you enjoy a book driven by character development, you may enjoy Touch much more than I.
Tori (Smexy Sidekick) likes the author’s adult series, but she DNF’d this book. It just was a let down.